Every new Toyota at Balise Toyota of Warwick comes with ToyotaCare*, which is a no cost maintenance plan that includes 24-hour roadside assistance. The ToyotaCare plan covers normal factory scheduled maintenance for 2 years or 25,000 miles, whichever comes first. Being a part of the ToyotaCare family ensures that your car, truck or SUV is only maintained with Genuine Toyota Parts. It’s also serviced by our skilled Toyota technicians who know your vehicle from the inside out. Since Toyota is devoted to the safety and protection of our Providence, Pawtucket, and North Kingstown drivers. That’s why the program offers engine oil and filter changes, tire rotations, multi-point inspections, and inspections/adjusts on fluid levels for 2 years or 25,000 miles. The 24-hour roadside assistance includes: battery jump start, lockout protection, emergency fuel delivery, tire service, towing. to the nearest Toyota dealership (within 25 miles of the nearest dealer), and winching. 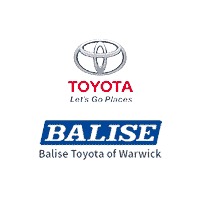 We’d like to invite you down to Balise Toyota of Warwick to learn more about ToyotaCare. Remember, this is a free service with each new Toyota vehicle. Now you can drive around Coventry and Cranston with added confidence and peace of mind. If you have any additional questions, please feel free to reach out to our Warwick service specialists. We can’t wait to meet you soon! * ToyotaCare covers normal factory scheduled service for 2 years or 25,000 miles, whichever comes first. 24-hour roadside assistance is also included for 2 years and unlimited miles. See Toyota dealer for details and exclusions. Valid only in the continental U.S. and Alaska. Prius, Prius Plug-in Hybrid, and Prius Prime comes with an extra year of roadside assistance, for a total of 3 years from date of purchase.